Although Di Suvero enjoys devising names, he held a contest to name this work. A New York City poet suggested Clock Knot, the winning title. On a sunny Saturday, a group from the Nasher Sculpture Center’s Avant-Garde Society gathered in an Austin hotel lobby, Starbucks coffee cups in hand, eager to start a day full of learning more about art. New York City’s Metropolitan Museum of Art has more art than they can possibly exhibit. Much is warehoused and rarely, if ever, viewed. 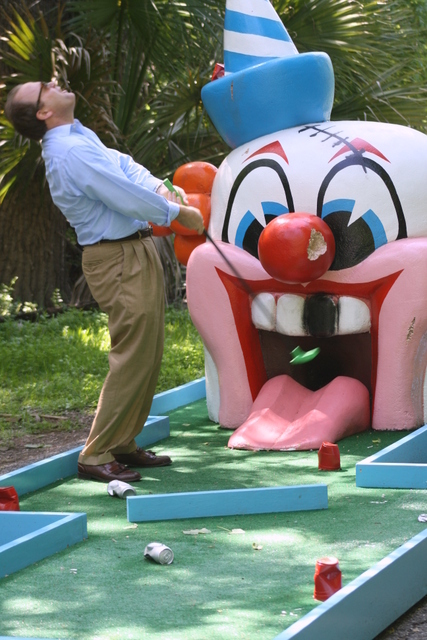 This “embarrassment of riches” isn’t unusual for a major museum. However, what is unusual and quite clever are the partnerships the Met is forming nationwide to make their stored sculpture and art accessible to the public. Jed walked us through the grounds and buildings giving us highlights. On view were sculptures by well-known artists, including Mark DiSuvero (see photo above). DiSuvero has said his large-scale sculptures are really “drawings in space.” Instead of charcoal and paper, he uses steel I-beams, industrial materials, a crane and space. 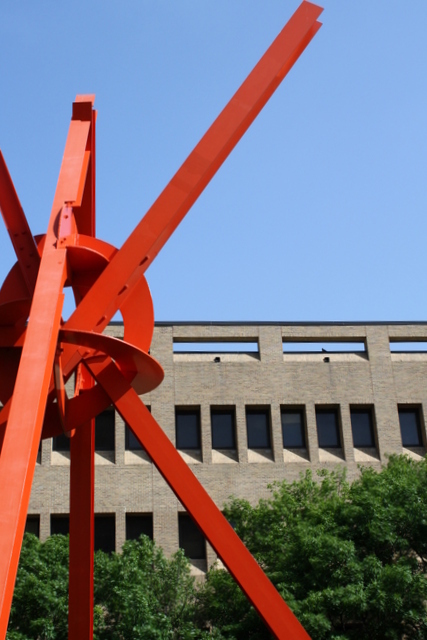 Favored by Dallas collectors, we have easy access to more of these bright red structures back home in the Dallas Museum of Art’s Ross Avenue Courtyard, the Meyerson Symphony Hall and NorthPark Center. 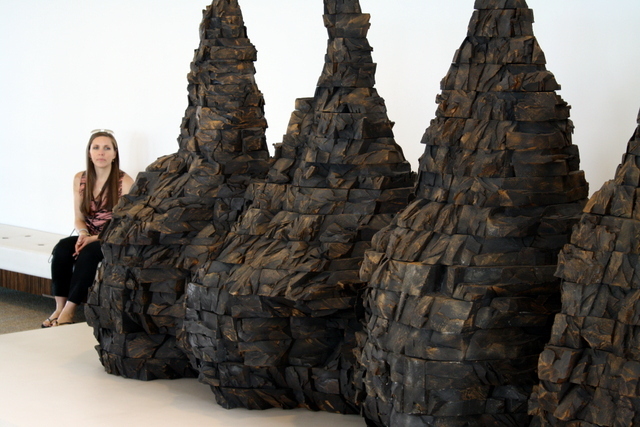 From the UT Landmarks collection, my choice was the Ursula von Rydingsvard sculpture, Seven Mountains (see photo below). It was made by gluing and doweling four-by-four inch lumber beams, the most ordinary of materials. Next, Ursula hand chiseled the surface until it became craggy and ancient, as if Mother Nature had eroded the forms into stone cairns over eons of time. Then, graphite powder was rubbed into the surface and burnished with steel wool pads until a silvery gray sheen developed. Simply gorgerous. If you are visiting Austin, you can take a self-guided tour of The Mets’ sculptures. Just download the map available on http://www.landmakrs.utexas.edu. The site itself is a good read, full of information and easy to navigate. We visited the studio and home of artist, Ginger Henry Geyer who is represented by the Valley House Gallery in Dallas, stopped for lunch at Chez Zee (of course – food is a given at any Avant-Garde Society event), and then visited two private residences. 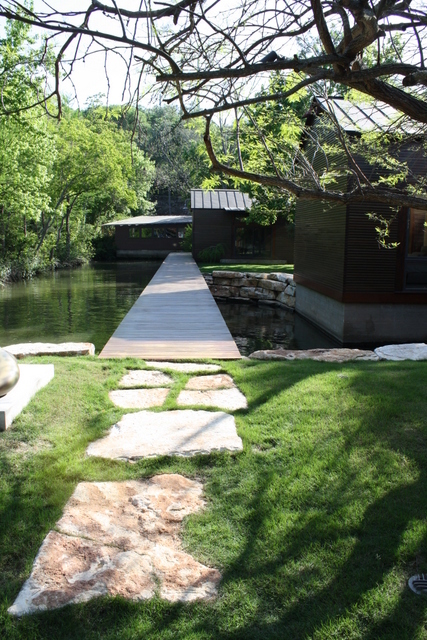 Below is the entrance to the second residence, designed by the San Antonio-based architects, Lake Flato who are famous for their Texas Vernacular Style. The couple who lives here has been cited in ARTnews’ “Top 200 Collectors” international list. Naturally, the works we saw were first class as was the couple who were so gracious, warm and welcoming. This was the last stop of the day – a peaceful waterfront peninsula. Many thanks for the fantastic organization of this day trip go to Maribeth Messino Peters and Scott Potter who Co-Chaired this year’s Travel Committee. This entry was posted in Art on the Green - Laguna Gloria, ARTnews Top 200 Collectors List, Avant-Garde Society, Dallas Museum of Art, Dallas-Based Contemporary Artist, Dallas-based contemporary painter, Lake Flato Architects, Landmarks Public Art Program, Mark di Suvero, Metropolitan Museum of Art, Nasher Sculpture Center Dallas, The Metropolitan Museum of Art, Ursula von Rydingsvard, Valley House Gallery and tagged Art on the Green - Laguna Gloria, ARTnews Top 200 Collectors List, Avant-Garde Society, Dallas Museum of Art, Lake Flato Architects, Landmarks Public Art Program, Mark di Suvero, Metropolitan Museum of Art, Nasher Sculpture Center, Ursula von Rydingsvard, Valley House Gallery by megfitzpatrick. Bookmark the permalink. Hi, Meg! What a great and informative post! I had no idea about all this art being loaned to UT. So great to know! Thanks for the heads up! Sure enjoying your blog! I really wish I could have been there! Great blog, Meg. Thanks for posting the recap and photos. Great summary of a fun weekend. It was a great group! I also loved the Seven Mountains sculpture. Enjoyed your blog. Enjoyed getting to meet and spend time with James and you in Austin. Hope to see you at the Eric Swenson opening this Friday night at the Nasher. We will be there Friday.